I recently walked into a cigar shop, bought a few Padróns, and asked for some matches, as I was planning on lighting one right then and there. The employee handed me a book of paper matches, and when I asked if he had wooden matches he replied that there were none. I don’t get it. How does a proper cigar shop still not have wooden matches? Paper matches are soaked in lighter fluid and can taint the flavors of a good smoke. A Friend of Cigar Smokers? I find it curious to see Congressman Kendrick Meek’s Democratic primary opponent in Florida attack Meek for his ties to the cigar industry. Meek may have received money from friends in the industry, but it isn’t clear that they got anything in return. Meek reportedly enjoys his cigars, but his voting record isn’t anything special. Maybe he’s working behind the scenes. When it came to making a public stand, Meek repeatedly voted for the massive SCHIP cigar tax hike, twice in 2008 and again in 2009 to pass the bill that eventually was signed into law by President Obama. If Meek overcomes the odds in his Senate race, he certainly won’t be the first Senator to enjoy the occasional cigar. I didn’t know it before, but judging from the photo accompanying this Daily Caller article, Senator Ben Nelson (D-NE) has quite the respectable cigar collection. 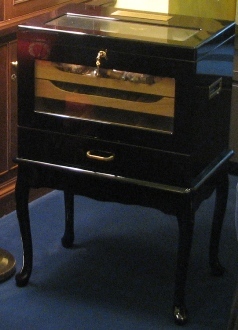 Another photo on the Senator’s Flickr feed gives an even better view (above) of the large cabinet humidor he appears to keep in his Capitol Hill office. I’m looking forward to the annual IPCPR Trade Show next week in New Orleans. StogieGuys.com will be covering the event with live updates from the floor, talking to cigar makers about their latest creations. When we first attended the show in 2008, members of the electronic media were few and far between. This year, it seems there are scores of bloggers descending on New Orleans. One sign of the change is that the IPCPR now warns media outlets that demanding free samples from cigar makers is grounds for revocation of their press credentials. The association is also reminding those new to the show not to disturb cigar makers while they take care of their primary mission: taking orders from retailers. Kendrick Meek and Ben Nelson may enjoy the occasional cigar, but I would argue that they are no BOTL and not friendly to fellow cigar smokers in any way. Both have supported massive tax hikes and increased federal regulation of the cigar industry. Any cigar smoker voting for their party should also be aware of what they are voting on themselves, their fellow smokers and the entire industry. Not that the opposition party is completely clean on the issue, mind you (Mike Huckabee supports a national smoking ban), but at least they have a better record of leaving cigar manufacturers, retailers and smokers alone. He also has a cheap, albeit effective humidor. Same one I have! Hahahah, like $200 bucks from the typical humidor liquidator sites. As we saw during the health care debacle Ben Nelson will throw principle out he widow along with the wishes of his constituents if he is made the right offer. He is up for election in 2012 and I will be surprised if he isn’t shilacked by who ever his opponent is. FYI: Back in 2008, Cigar Aficionado ran a fairly lengthy piece on Meek and his cigar connections. I think you can still find it on the Web. Just wanted to comment on “Tradeshow Time”…. I think if manufactures took a closer look at the impact that sites such as this one, have on their industry, they would probably be more welcoming to their presence. Social Media and blogger sites give these manufactures an unprecedented amount of “free press” and grass rots advertising. All with no cost to them. Hopefully there will be more “cigar blogging ambassadors” that can reach out to these companies and explain the benefits of having somebody promote their products for FREE. Thousands of people visit these sites every hour and we have the analytical data to back it up, i.e web traffic and website rankings. I’m not suggesting that every cigar maker simply give out free samples to everybody with media credentials @ IPCPR, but I would encourage them to network more with the people that own these sites. If a website is giving your cigars fantastic reviews and they get 600 – 900 visitors everyday, it probably wouldn’t hurt to form some kind of relationship. Hell, make it a project for one of your interns.